Traditionally, the default method of generating building footprints for a specific area involves getting aerial or satellite imagery, and manually annotating these images, which is costly, time consuming and not scalable. At Ecopia.ai, we’re disrupting this traditional method by using next generation artificial intelligence and machine learning, to drastically reduce costs and timeframes, while being able to scale quickly across the globe to meet your needs. 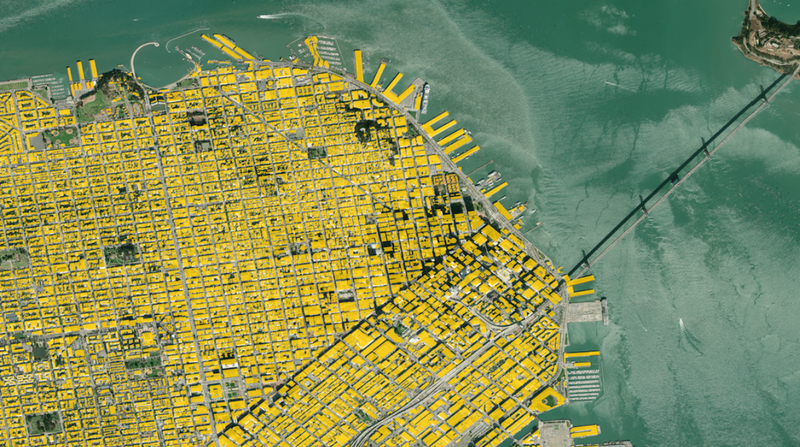 In 2018, alongside imagery partner DigitalGlobe, Ecopia mapped the first precision, GIS-ready building footprints dataset of the entire United States, making it readily available off-the-shelf. The Ecopia U.S. Building Footprints powered by DigitalGlobe dataset includes more than 169 million building footprints created by proprietary artificial intelligence algorithms in combination with high-resolution, high-accuracy satellite imagery from DigitalGlobe. This 2D polygon dataset is a semi-automated solution with a greater than 95% accuracy rating, which is uniquely high in the industry. We’re committed to refreshing footprints every year, based on new DigitalGlobe imagery, which means the dataset will be the most current information available. 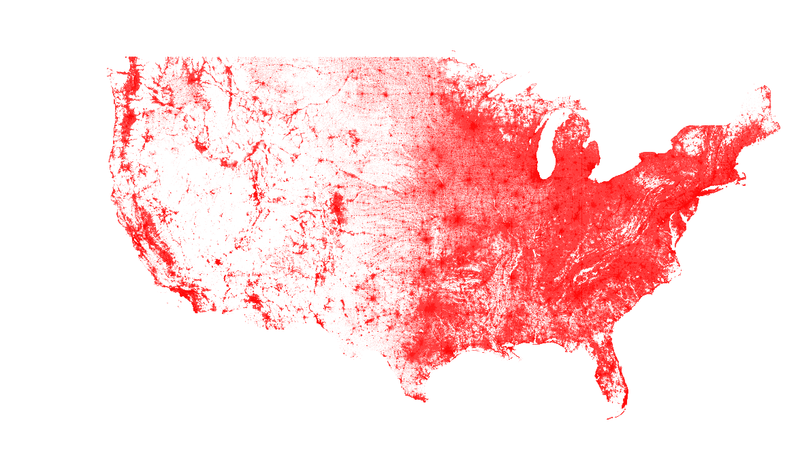 Image above represents building density across the USA, 169+M buildings in 2018. Ecopia U.S. Building Footprints powered by DigitalGlobe dataset is used by customers in insurance, where risk assessment, and disaster management are more easily qualified with up-to-date building footprints. Local governments and businesses use building footprints to properly assess land use, and urban planning. But we aren’t just limited to these industries, or the United States. Across the globe, we’re producing over 40 million building footprints a month, working with NGOs in Africa to help control disease outbreaks, and assist developing governments in creating postal service maps, identifying placement of electric grids, or improving taxation procedures. With accurate and scalable footprints across the globe, we’re empowering industry leaders to make better decisions quicker. To learn more about how you can use Ecopia U.S. Building Footprints powered by DigitalGlobe, please reach out to us here or email sales@ecopiatech.com. Using Artificial Intelligence and Machine Learning to build large-scale high-definition (“HD”) vector maps that support superior location-based decision making.